Named by Golf Digest and Golf Magazine as one of the best resort golf courses in America, and the #1 golf resort in San Diego according to the readers of Condé Nast Traveler, Aviara Golf Club is host to the LPGA Kia Classic. The only San Diego golf course designed by Arnold Palmer, Aviara Golf Club features a memorable coastal layout: par 72, 18 holes across 7,007 yards uniquely sculpted around rolling hillsides, native wildflowers, and plenty of bunker and water challenges. The Coronado Municipal Golf Course, opened in 1957, is rated as one of the best public golf courses in the nation. 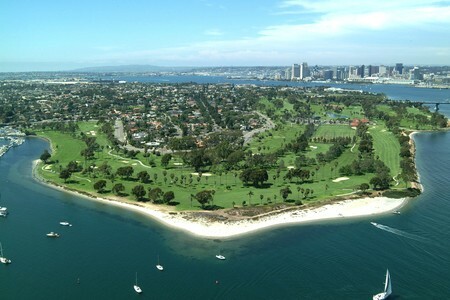 For public golf in San Diego, Coronado is the best choice. We are located just minutes from downtown San Diego. The course measures 6,590 yards from the blue tees and is a par 72. Immaculate greens, wide inviting fairways and dramatic views coupled with incomparable weather, make Coronado a must-play for all golfers year round.